The MBNA Alaska Airlines credit card is an interesting card. For many people, this is going to be a great fit, while for others, it simply wont make much sense. The MBNA Alaska Airlines card earns valuable Alaska miles, gives a US$121 companion ticket every year and there is a bonus earning for purchases made on Alaska Airlines. Personally, I think certain groups will take greater value out of this card than others. There is definitely value here for many people. In the world of Canadian credit cards in 2016, I would argue that the cash rewards and fixed value cards are the most valuable. However, if you have a use for airline miles that will get you great value, then you will want to generate the kind that gets you that best value. In 2016, it seems there are only a few types of miles that you can earn from Canadian credit cards. Each of them have their drawbacks, and I would argue that Alaskan Airlines miles are probably the most valuable to many Canadians. In the race to the bottom, Alaska miles seem to be behind Aeroplan and American, and have still maintained their value (though that could change at any time). 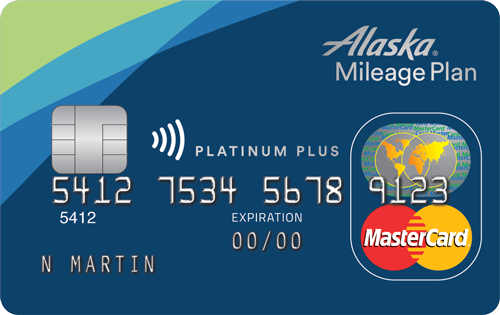 The MBNA Alaska Airlines card earns 1 Alaska mile per dollar spent on all purchases and 2 additional (total of 3) miles per dollar spent on Alaska Airlines purchases. Using Alaska Airlines miles for great value is something that will be bigger than this article. However, I will note that personally, I tend to value Alaskan miles in the range of 1.5¢ (Canadian). In general, I fly in economy and am not willing to pay a premium for business class and thus the value I would return from a mile will be lower. 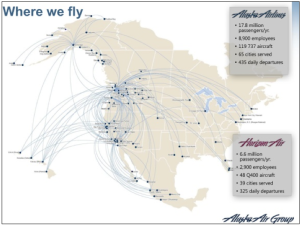 What makes Alaska Airlines miles so valuable is that they have a wealth of partners and some nice routing rules. If you do not live in one of these cities, it is fine because the miles are still valuable when you use them on partners. Just not that you can’t use an award to buy a flight that requires the use of more than 1 partner. Also of note is that Alaska Airlines also recently (April 2016) bought Virgin America Airlines. Virgin America used to run a flight from Toronto / YYZ to San Francisco and Los Angeles but those are not currently in operation. It remains to be seen how this merger will affect the route map, though in general it would seem that it would not affect Canadian destinations at all. 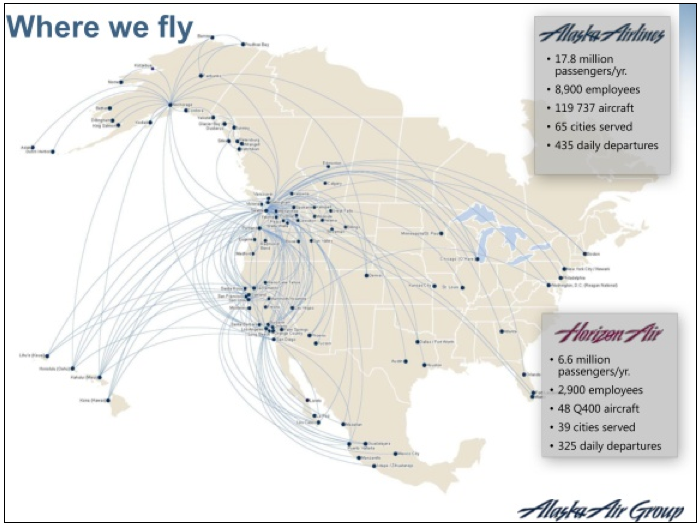 Alaska Airlines partners with a few of the major carriers, and each has their own award chart. The interesting thing is that in some cases, it costs fewer Alaskan miles than the partner airlines miles for their own flight. As a Canadian, the one that jumps out at me is that it takes 12.5K Alaskan vs 15K AAdvantage (American Airlines miles) for a one-way Canada to US 48 flight on American Airlines. Alaska miles are also the only way to book Emirates flights or Delta flights using miles that can be earned from a Canadian credit card. The biggest advantage of Alaska miles is that you have the ability to take a free stopover on every one-way flight redemption. If you live in or near an Alaska Airlines hub city, you would effectively take your stopover there and double the value of your miles. Award redemptions are all treated as one-way flights. There is no penalty / benefit to booking roundtrip flights so you are always incentivized to book one-ways and take a stopover at home every time. For example, if you were interested in booking a flight from San Francisco to Seattle, it would cost you 12.5K for the one way. Well, you could just route that as a San Francisco to Seattle, stopover in Seattle for months on end, then continue your journey Seattle to New York and that would cost you only 12.5K as well, since you took a stopover in Seattle, which happens to be your home. The annual fee on this card is $75, and it is not waived in the first year. This is offset by the fact that each year you earn a coach companion ticket for US$121. Basically, if you are traveling on Alaska Airlines, you can buy a second ticket on the same itinerary for another US$99 (there is a US$22 tax that you have to pay making it $121). Companion certificates can only be used for a coach class seat on an Alaska Airlines operated flight with the purchase of another ticket on the same Alaska Airlines flight within or between the continental United States, Alaska, Canada, Hawaii or Mexico. The board room membership discount applies only to the initiation fees associated with an annual membership fee and does not apply to the annual or renewal membership fees. These promotions are offered exclusively by Alaska Airlines. The Toronto-Dominion Bank is not responsible or liable for any aspect of this promotion. For a complete explanation of these benefits, please visit www.alaskaairlines.com. In terms of a signup bonus, this card comes with a 25,000 Alaska mile sign up bonus. As mentioned, they do NOT waive the annual fee in the first year. In my estimation at 1.5¢ per Alaska mile, the value of this sign up bonus is in the range of CAD$375, though you have to pay the $75 annual fee in the first year to get this. 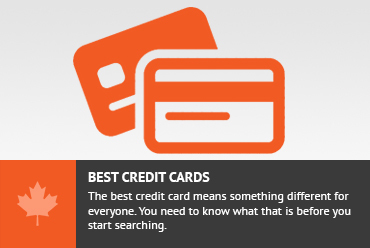 In terms of comparing this to other cards, the most natural cards to compare to would be the other airline cards such as TD Aeroplan. It is also interesting to compare this to the MBNA World Elite card that gets a straight 2% cash back. As mentioned, the MBNA World Elite gets 2% cash back as compared to the MBNA Alaska Airlines 1 mile / dollar spent and 3 miles / dollar spent at Alaska Airlines. I have mentioned that I value Alaska miles in the range of 1.5¢ each, meaning that the MBNA World Elite card is a better place for my non-bonused spend. 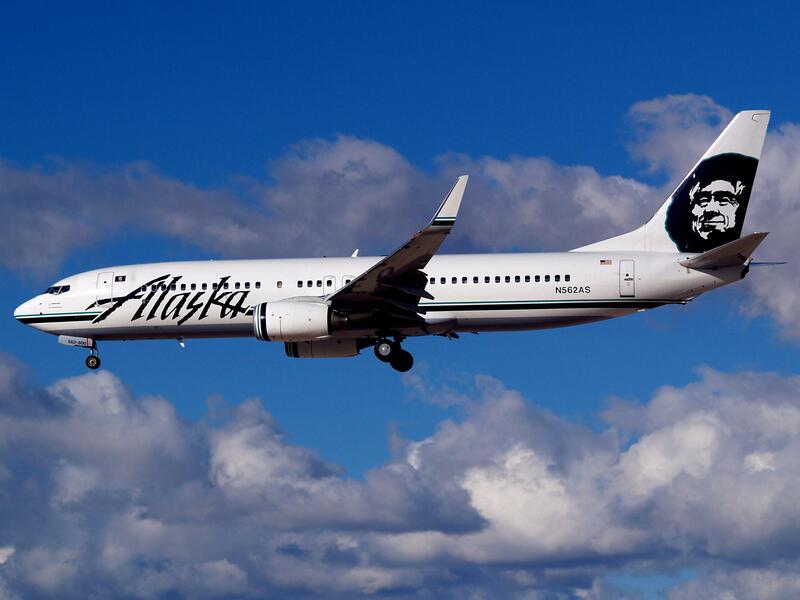 If you are spending a lot on Alaska Airlines purchases or you value Alaska Airlines miles more than 2¢ then you would be better off with the Alaska Airlines card. The signup bonus on the World Elite is only $100 and no annual fee in the first year, which contrasts with the 25000 Alaska miles and the $75 fee in the first year. If you are interested in earning a high sign up bonus then the Alaska card would be a good way to do this. The TD Aeroplan card earns Aeroplan miles while the Alaska card earns Alaska miles. It really comes down to whether you can get better use of Alaskan or Aeroplan miles. They both earn 1 mile / dollar, but the TD Aeroplan bonuses gas and groceries (1.5 Aeroplan / dollar) while the Alaska card bonuses Alaska purchases (3 Alaska miles / dollar). Also the Aeroplan card waives the bag fee on Aeroplan award tickets. In terms of sign up bonuses, the TD Aeroplan ranges from 15K to 30K Aeroplan miles, depending on the season vs 75K for the Alaska card. The annual fee is $120 for the TD vs $75 for the Alaska. It is really difficult to compare the cards as the value of Aeroplan miles and Alaska miles will vary wildly from person to person. Though, if I had to choose, I think the Alaska card is better as the annual fee is lower and I think the Alaska mileage program is better than Aeroplan for my type of travel. The MBNA Alaska Airlines credit card is a World Elite Mastercard and comes with the standard premium benefits, such as car rental coverage and warranty protection. There are no notable benefits on this card that should influence you to get or not get this card. The MBNA Alaska Airlines card is a good card for certain groups of people. I think it is up there with the best cards in airline card space in Canada in 2016. The sign up bonus of 25K Alaska miles comes with a $75 annual fee that you have to pay in the first year. If you are on the fence then this is not a bad deal. Don't subscribe All Replies to my comments Notify me of followup comments via e-mail. You can also <a href='https://www.creditwalk.ca/comment-subscriptions/?srp=4739&srk=2648578ecea05c83754707575dc5a494&sra=s&srsrc=f'>subscribe</a> without commenting.